If you are looking to add a little heat to your event, you may wish to consider a fire performance. 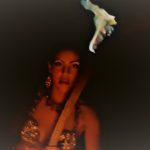 Currently, we offer three types of fire performances – belly dancing with candelabra, candles and fire sword. Candelabrum / Candelabra: Sometimes referred to as a, “candle tree,” a candelabra is an ornate candlestick holder with multiple appendages. The candelabra (or candelabrum) used is specially created for use in performances, having an attached that fits snugly on the performer’s head. The performer then balances the candelabra on her/his head. Candles: Performances with candles are also available, in which the dancer may dance with and balance multiple, individual candles thoughout the performance. Fire Sword: For an extra touch of danger and mystique, the fire sword is a popular choice for some events. The tip of the sword is lit, and the sword is balanced on the dancer’s head, or other parts of the body. The fire sword is only recommended for certain events and can only be performed under certain conditions. The fire sword act, for example, cannot be performed outdoors in cases of high winds. Furthermore, some venues do not allow for fire performances. For a truly “hot” performance, fire dancing is a guaranteed to delight audiences of all ages. However, it is imperative to make sure that adding a fire act to your event is feasible beforehand. Check with your event’s venue, if indoors, or check for weather conditions if outdoors. Also, it is highly recommended that an indoor venue is as large as possible to accomodate a fire performance, and that there is at least a 7 yard distance between the fire entertainer and the audience.